Cream the butter and sugars together until fluffy. Add the eggs and vanilla. In a separate bowl add the remaining dry ingredients and whisk to combine. Add to the butter mixture and combine until blended. Stir in the chocolate and nuts until combined. Using a small ice cream/ disher, scoop the dough onto the lined baking sheets. Bake for about 13 minutes until just set and edges are just barely beginning to turn brown. Remove the oven and allow to cool on baking sheets. Line baking pans with parchment paper. Cream the butter and sugars together until well combined. Beat in the eggs ,vanilla then pumpkin puree. Combine until blended. Add the remaining dry ingredients to a bowl and whisk to combine. Add to butter mixture and blend well. 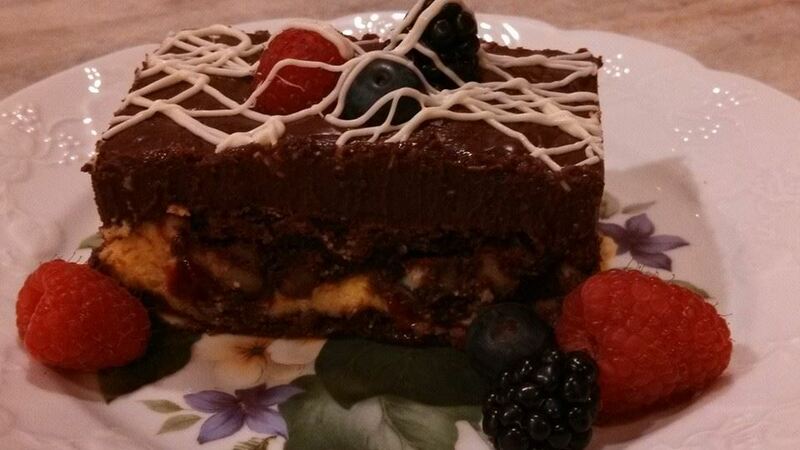 Stir in the chocolate and nuts. Using a small ice cream scoop/disher scoop out the dough about 2 inches apart onto the baking sheets. Bake for about 12 -15 minutes until just set and edges are barely brown. Remove baking pan from oven and allow cookies to cool on baking sheets before removing. Beat cream cheese until smooth;add the sugar and vanilla. In a separate bowl whip 3 cups of the heavy cream until soft peaks form. Fold in the cream into the cream cheese mixture until well combine. Divide mixture in half. To one half fold in the melted chocolate until well blended; set aside. To the other half fold in the pumpkin butter until well blended; set aside. Line the bottom of the pan with sliced pumpkin pound cake about 1/2 inch thick; filling any open spaces with small pieces of pumpkin pound cake. Don’t concern yourself with the looks. 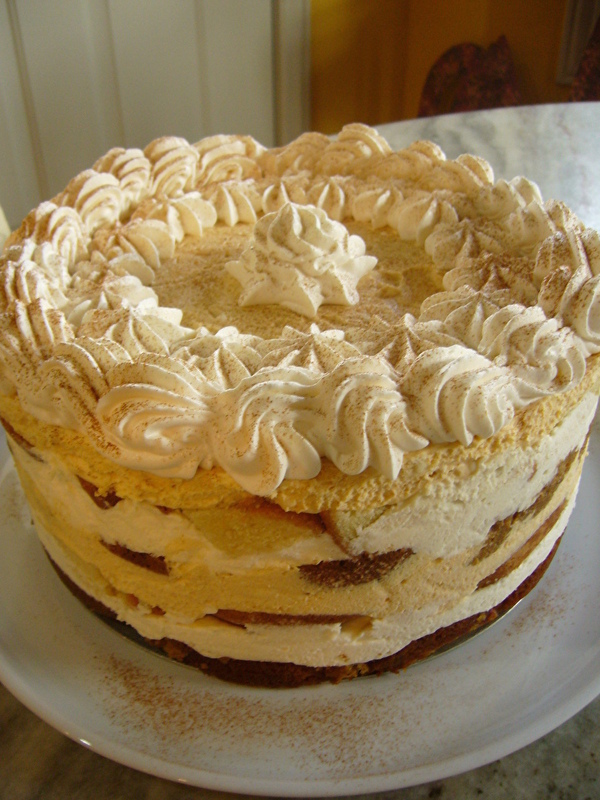 Brush cake with apple cider or Calvados and cover with a layer of white chocolate filling. 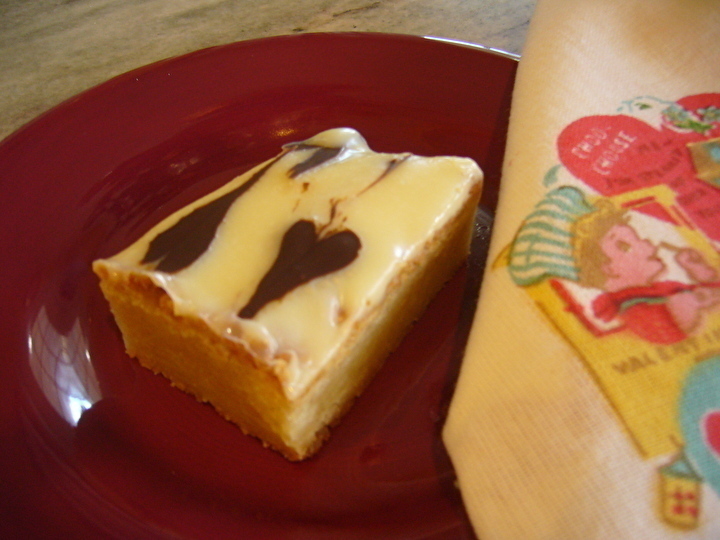 Arrange the vanilla pound cake in the same manner as the pumpkin and top with some pumpkin filling. Repeat until pan is full and top is finished off with the pumpkin filling. Cover top with plastic wrap and refrigerate overnight. Remove the plastic wrap. Whip the reserved 1 cup of heavy cream, sweetened with 1/4 cup powdered sugar and 1/2 tsp vanilla. 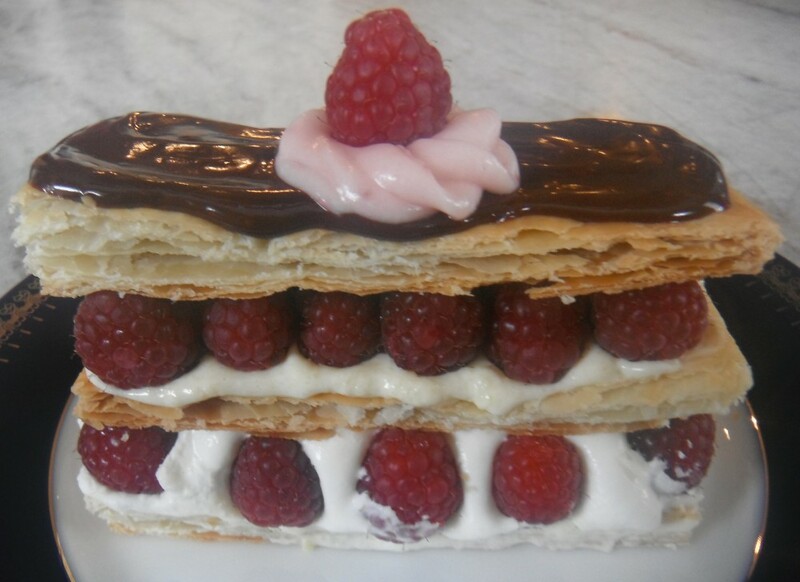 Spread on top or pipe on top decoratively. Sprinkle top with cinnamon. Store in refrigerator. Allow to set at room temperature 20 minutes before serving. Grease and line with parchment a 12x8x2 inch pan. Preheat oven to 350 degrees. Put the chocolate in a large bowl. Melt the butter until it just begin to boil. Pour melted butter over finely chopped chocolate and stir until chocolate is completely melted. Put the eggs , sugar, vanilla extract and vanilla seeds in a bowl and whisk to combine. Whisk into the melted chocolate until combined. Fold in the flour and salt. Pour into prepared pan and spread evenly. Bake for about 30-35 minutes until top is golden brown. The center will still be gooey. Remove from oven and allow to set on rack for 1 hour. Meanwhile, prepare the white chocolate ganache. For the ganache, warm the heavy cream just until it begins to boil. Pour over finely chopped chocolate and stir until well combined and all the chocolate is melted. Pour over warm brownies. Place in refrigerator until firm. 3 hours to overnight. Cut into 12 pieces. Lemon Cupcakes with Lemon Curd and Lemon White Chocolate Cream Cheese Frosting are out of this world. Place the flour, salt and baking powder in a bowl, whisk until combined well. In the bowl of a stand mixer fitted with the paddle attachment combine the butter, sugar and zest and cream until fluffy. Add the eggs one at a time. Blend well between each addition. In a liquid measuring cup combine the milk and vanilla. Add the flour alternately with the milk mixture until just combine. Fill the muffin tins 2/3 full. Bake for about 20-25 minutes until a toothpick inserted into the center comes out clean. Allow to cool in pans 5 minutes and then remove from tins and transfer to rack to cool completely. Combine first 5 ingredients in a heat proof bowl and whisk to combine. Place bowl over saucepan with simmering water. Do not allow water to touch bottom of bowl . Stir until mixture is thick , remove from heat and stir in butter which has been cut into pieces. Allow to cool and store refrigerated in airtight container. Using an apple corer, core out the center of each cooled cupcake. Filled the centers with lemon curd using a pastry bag. Fill another pastry bag fitted with a plain tip with frosting and pipe on top of cupcakes. 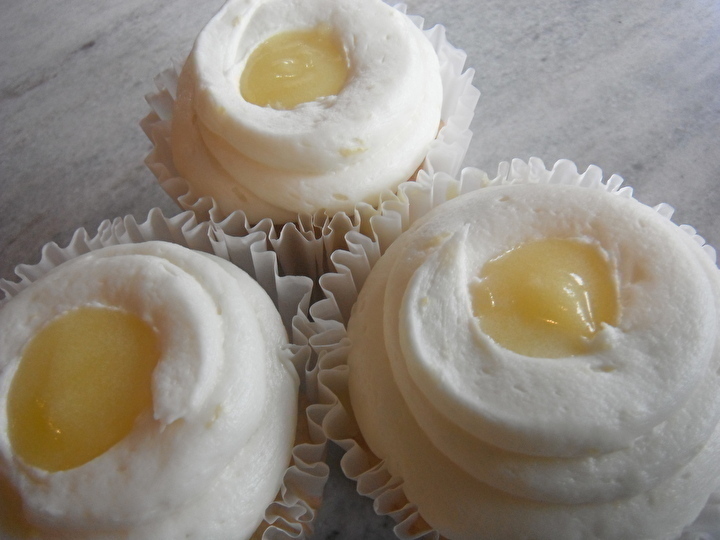 Using a small spoon make a divot in the center of each frosted cupcake and spoon a small amount of lemon curd in it. 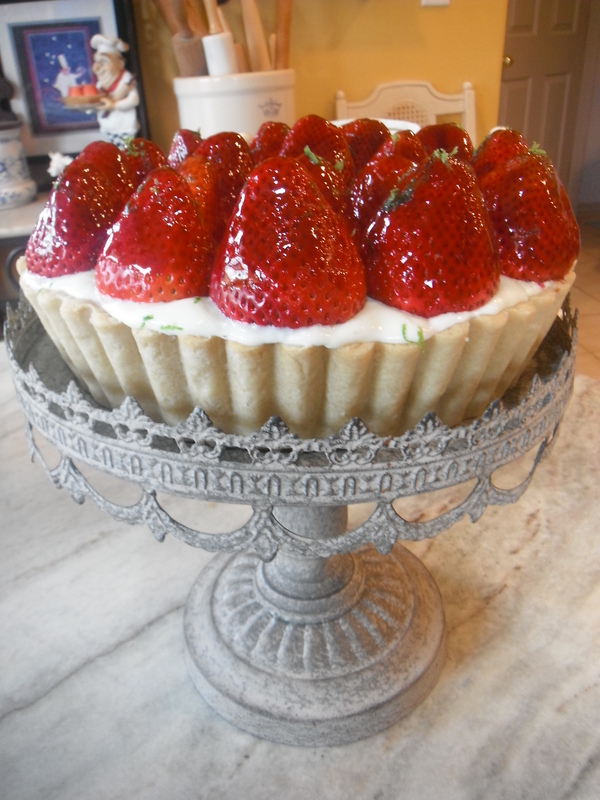 Celebrate the warm sunny days with this Strawberry Lime Tart. Preheat oven to 350 degrees. In a bowl of a food processor fitted with a metal blade add the flour, salt and pulse a couple of times to combine. Add the cold butter chunks and pulse again until mixture resembles coarse crumbs. Pulse in ice water and continue to pulse until dough begins to form. Remove dough and wrap in plastic wrap. Refrigerate 30 minute. Remove from refrigerator and roll out to fit a 10×2 inch tart pan with removable bottom. Place back in the refrigerator for 30 minutes. Remove once again from the refrigerator and prick the bottom and sides and blind bake the crust until golden. Remove from oven; sprinkle with chopped white chocolate. Using a pastry brush , spread the chocolate evenly on the sides and bottom of crust. Allow to cool completely. Reserve enough whole strawberries to completely cover the top of the finished tart. Slice the remaining strawberries and evenly cover the bottom of the cool chocolate covered tart shell. Set aside. In a bowl of a food processor fitted with a metal blade add the condensed milk, lime juice, room temperature cream cheese and zest from 1 lime. Process until smooth. Pour into crust with strawberries and spread evenly. In a small bowl combine the sour cream and powdered sugar; spread evenly over the top of the lime filling. Place in refrigerator to firm up slightly. Place the whole strawberries over the top of the tart. Place a small amount of seedless raspberry jam in a small bowl; add a touch of water and heat in microwave enough to create a syrup. Using a pastry brush , gently brush the syrup on each of the strawberries to create the glaze. Sprinkle lime zest over the top. Refrigerate until firm. Remove from tart pan and slice when firm.